You can use Bulk Chocolate Coins as favors to liven up a party, as prizes in a treasure hunt, or as tokens in a game. Kids love the shiny foil wrappers as well as the melt in your mouth flavor of the hidden chocolate candy. There are different levels in the quality of foil wrapped chocolate coins. I have actually tasted some in bygone years that aren't even worthy of the name chocolate - ewww! Nevertheless, you can still get some cheaper chocolate coins that are edible, but won't break the bank. You will find them at the Candy Warehouse and at Candy Crate. You can also get these coins made of a much higher quality chocolate. I would go so far as to call them gourmet chocolate coins. Chocolate candy coins can be a lot of fun. If you want to use them as favors at a party, you can put a half dozen or so in a little cellophane favor bag and secure it with a twist tie or ribbon. You can get the favor bags for pennies at Candyland Crafts. Now here is an idea that is really cute! 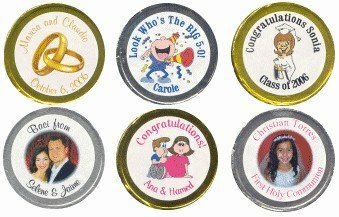 Consider spending a few extra dollars to get custom stickers printed at Candy Wrappers that are personalized to match your party or special occasion. They are terrific and so inexpensive. I love it!! Other ideas are to use them as payment for chores around the house, or prizes in a game at school or at a youth group activity. Use your imagination, and have a lot of fun! If you come up with a clever way to use bulk chocolate coins, I would love to hear about it. Some of us are not as creative as others, so your ideas can be shared and passed around. Just add your idea here.